3D sound, or surround sound as its more commonly known, as has been going through something of a renaissance in headset market, so it seems only fitting that the tech should get another revivalist interpretation in the form of some new Bluetooth wearables from LG. Set to be unveiled properly at CES 2017 in January, the LG Tone Studio is a personal wearable speaker featuring four individual speakers – two full range on the top and two vibrating on the bottom – that give a personal surround sound experience when watching a movie, playing a video game or simply streaming music. The Tone Studio features a Hi-Fi DAC (Digital to Analog Converter) that enhances sound quality by recreating audio content as accurately as possible. It also comes with Dual Play, so you can connect two LG Tone Studio wearable speakers and share the sound from a movie, playlist or more. 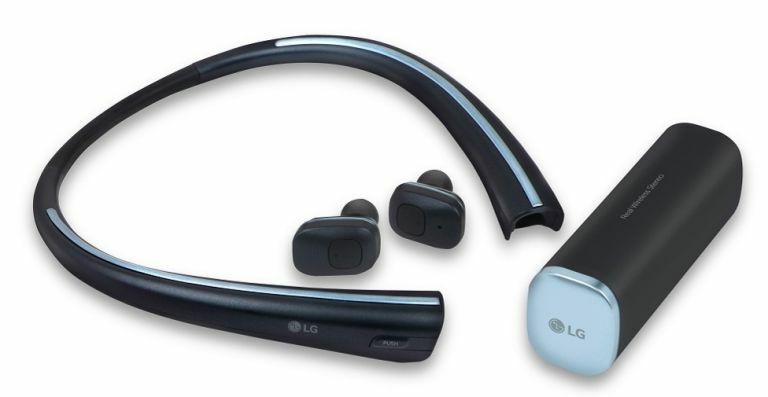 There's also the Tone Free, LG’s first wireless stereo product to come with wireless earbuds that charge whenever they are stored inside the neckband, making them easy to charge and carry. "LG has a rich legacy of innovating in the wearable audio market, and our products have become the standard by which all other earphones are judged," says Michael Park, vice president of Innovative Personal Devices Business Division at LG Electronics. "We are committed to leading the way in this fast moving market by developing exciting new products which appeal to every music-loving and convenience-seeking individual." CES 2017 will once again take place in Las Vegas, Nevada, running from 5-8 January.